So who are Gornik Zabrze? To be honest I wouldn’t be surprised if you haven’t heard of them, in fact before starting this save I wasn’t even aware of their existence! But they are actually the 2nd most successful team in Polish history behind Legia Warszawa. They have a record number of Ekstraklasa (Polish League) wins with 14 and in addition to this, they have 6 Polish Cup’s, 1 Polish League Cup and 1 Polish Super Cup. They also hold the record for the most consecutive Polish League wins with 5. These came back in the sixties: 1962/63 season to the 1967/68 season. The last time Gornik Zabrze won a trophy was in 1998 when they won the double with an Ekstraklasa title and a Polish Super Cup win. In fact, this is their first season back in the Polish top division after suffering a devastating relegation in the 2015/16 season. 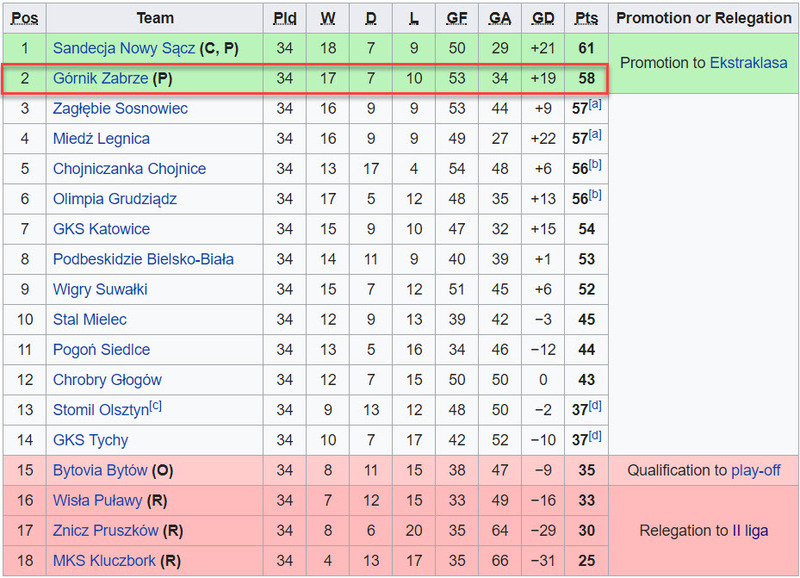 They were promoted last season after beating Zagłębie Sosnowiec and Miedź Legnica to 2nd place by just 1 point! Gornik Zabrze are nicknamed Trójkolorowi (Tri-Color) – this is because of their famous home kit is a mixture of blue, white and red. They play in the Ernest Pohl Stadium which has a capacity of 31,871 people. This stadium was unfortunately named the Adolf Hitler Kampfbahn from 1934-1946 due to Nazi influence in Poland at the time. Their main rivals are Ruch Chorzów who were relegated from the Ekstraklasa in the 2016/17 season, meaning they won’t meet each other for at least another season. Notable former players for Gornik Zabrze include Arkadiusz Milik who scored 11 goals in 38 appearances for the club, he is currently plying his trade over in Italy for Napoli. Another player who is also in Italy is Łukasz Skorupski who came through the youth ranks at Gornik Zabrze, he is currently on loan at Empoli from AS Roma. My main aim for this series is to obviously return Gornik Zabrze to their former glory. I am hoping that I can get them into some form of European competition sooner rather than later. Obviously, I’m not expecting that this will happen overnight as we have been predicted to finish 15th (2nd Bottom) in the upcoming season so we definitely have a lot of work to do! A secondary goal for this save is to increase the reputation of Polish football, not only in Europe but around the world. 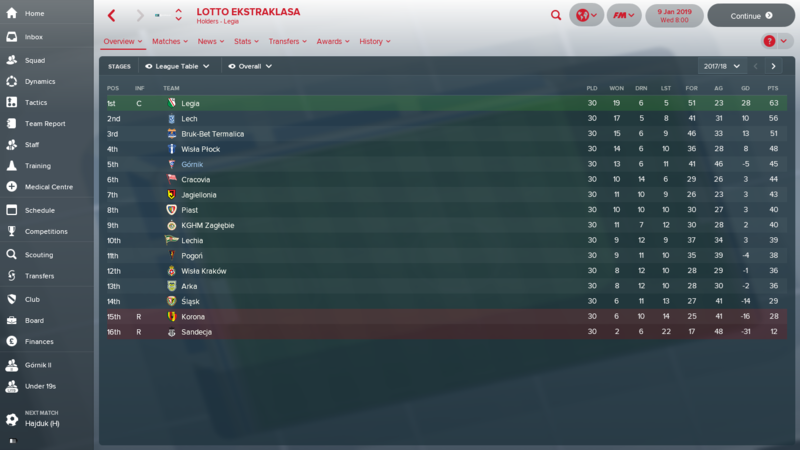 Currently, the Ekstraklasa is ranked as the 21st best league in Europe behind leagues such as the Belarusian Highest League and the Romanian First League. We are ranked around the same the Sky Bet Championship who are ranked in 19th. I am hoping that when/if we get into a European Competition and hopefully go into the latter stages we will see the reputation of the Polish league increase, which would encourage even better players to come to the Ekstraklasa. 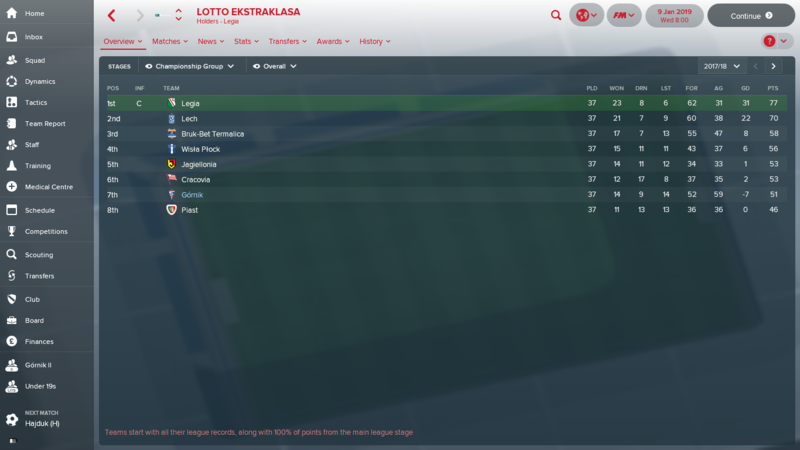 In total I have made 5 signings in my first season in charge of Gornik Zabrze – these were broken down into 2 for the first team and 3 for the under 19’s. For the first team I signed Paul Stieber, a German fullback, as my back up right back. Then came Denis Perger – another fullback but Slovenian this time. He will be my starting left back this season. For the under 19’s I signed Tomasz Karmanski, Radoslaw Fryczkowski and Marek Antkowiak. I know what you’re thinking – “these Polish names don’t get any easier do they!”. Fryczkowski and Antkowiak have 4 and 5-star potentials respectively so I am expecting them to have a bright future at the club. Outgoing players included youngsters Karol Jaksik, Mariusz Przybylski and Krzysztof Kiklaisz who were sold for a total of £3k. Also young prospect Wojciech Hajda went out on loan to GKS Tychy in the Polish second division. When I first joined the club there was hardly any staff and, even with the additions I have made, the level of staffing is still pretty poor. 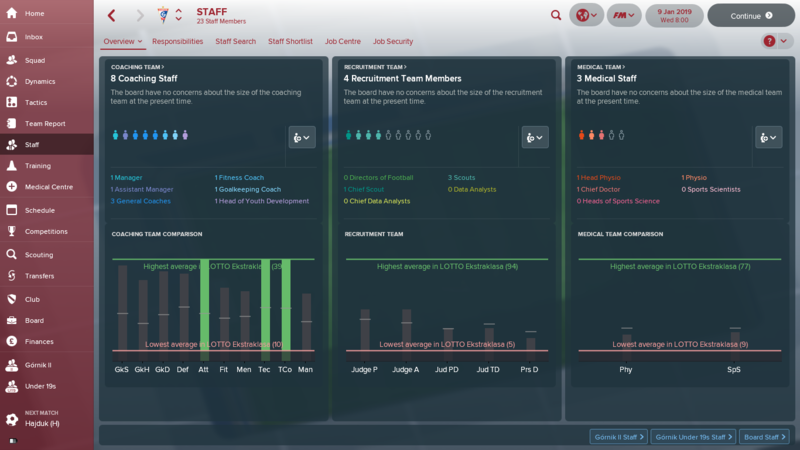 The board simply haven’t allowed any extra staff to be brought into the club. Hopefully, as the board’s confidence in me increases, they’ll allow for extra staff to be signed. We didn’t have the best start with Gornik Zabrze as our first game was played in the Polish FA Cup away to 2nd division side Chrobry Glogów. They took us to extra time and eventually beat us 1-0. In terms of the League, after 30 games played we finished in 5th position and 1 point ahead of Cracovia. This meant that we qualified for the Championship group for the second part of the season. Basically after 30 games played the 16 team league is split into two separate groups a relegation group and a championship group. I was extremely happy and even somewhat surprised to finish in the Championship group because, as I mentioned earlier, we were predicted to finish in 15th place. After the Championship group had been played we finished in an overall position of 7th in the Ekstraklasa with a record of 14 wins, 14 defeats and 9 draws. Personally, I was awarded the manager of the month award in November and also March for impressive performances in these particular months. I was also shortlisted for the manager of the year but unfortunately, I didn’t pick up this title. Rafal Kurzawa was selected in the LOTTO Ekstraklasa team of the season with Sandi Arcon on the bench. I’m very pleased for both of these players because they truly had awesome seasons. Sandi Arcon was also voted as the fans player of the season which I totally agree with as he was not only our top scorer with 16 goals this season but also achieved our highest average rating too! Gornik Zabrze were also the winners of the LOTTO Ekstraklasa fair play award, this award is given to the team with the least yellow and red cards throughout the season. So that’s it for Part 1 of my Rebuilding Gornik Zabrze save on FM18. I hope that you enjoyed this post and if you have any suggestions either for transfers or even how to improve this blog please either comment below or head over to my Twitter @Casual_FM_, once again thank you for taking the time to read this blog!